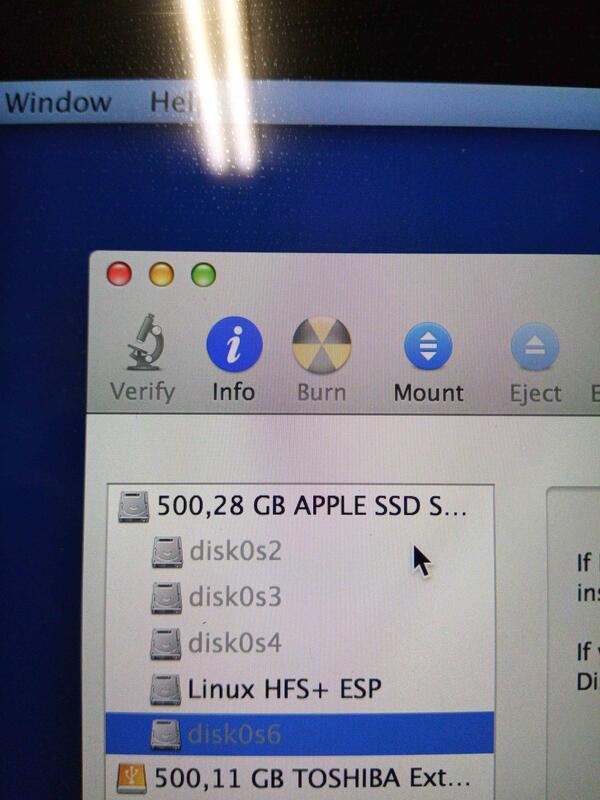 A client has a MacBook Pro Retina with a FileVault2 encrypted boot drive, and the Mac used to dual boot with Linux. Disk Utility apparently showed 4 partitions [Mac HD, Linux, and other 2 small partitions, likely used by Linux as it too was full disk encrypted. He managed somehow to delete one of the small partitions, and now all disk utility shows are disk0s1, disk0s2, and so on, without even the containing physical drive above in the list. The os was 12.12.4 [likely, definitely 12.12.x]. Of course he doesn't have a backup. He has the recovery key for FileVault2. Any ideas? The partition map seems valid and no important small partition has been deleted (maybe one less important EFI or Apple_Boot partition between partition 5 and 6 - the other gaps of unallocated disk space are too small to contain a useful partition e.g. 1648 blocks = ~844 kB). Partition 2 and 3 of disk0 got the wrong partition type though - the encrypted partition/data shouldn't be lost. Partition 3 has the typical size of a pre-APFS recovery partition (1269536 blocks) and partition 2 probably is the FV2 partition. The proper type of a recovery partition is 426F6F74-0000-11AA-AA11-00306543ECAC and the proper type of a CoreStorage partition (the base of FV2) is 53746F72-6167-11AA-AA11-00306543ECAC (instead of FFFFFFFF-FFFF-FFFF-FFFF-FFFFFFFFFFFF). Boot to Internet Recovery Mode or another external boot drive and modify the partition types with gpt. Not the answer you're looking for? Browse other questions tagged disk-utility encryption filevault bootable-disk . Can I set an institutional recovery key for Filevault2 after Filevault2 is enabled?